Being subtropical passionfruit plants need full sun and shelter from winds and frost. Even one or two degrees of frost can cause tissue damage and reduce potential cropping. Passionfruit do best when planted out in spring when all risk of frost has passed, or in autumn in frost-free areas. Plant in a well-drained, highly fertile loam with good levels of organic matter to aid moisture retention through dry periods. You can even add some sand to improve drainage. Plant firmly on mounded-up soil. Make sure the roots are lightly covered and avoid burying the plant too deeply. Passionfruit love the heat as long as they get sufficient moisture. The root system of passionfruit is very shallow but extensive, so it’s particularly important to water regularly throughout the flowering and fruiting period (from spring until the end of summer). When watering, keep the water off the foliage to avoid fungal problems. Mulching will help retain moisture. Passionfruit are heavy feeders and on most soils nutrients will need to be topped up regularly with a well-balanced multi-mineral fertiliser like rock dust as well as an animal manure like sheep pellets. Feed at least twice during the spring-autumn period. Over the fruiting period the application of a combination fish and seaweed liquid fertiliser is also recommended. in just one growing season. This vigorous growth habit means the plant or plants need to be trained along and supported by strong structures. While not absolutely necessary, early training helps to establish a framework of leaders from which laterals will grow and bear fruit. So once you’ve planted your vine pinch off any side shoots and train the leader until it reaches the support structure. Then pinch out the growing tip to force the production of laterals. These are then trained along the support. A handful of insect pests can be troublesome to passionfruit. Sap-sucking passionvine hoppers can significantly reduce yields if they’re present in large numbers. Mealybugs can become an unsightly pest on the fruit and aphids can attack tender new shoots. Spray with neem oil to deter all of these. The stinking green shield beetle can cause skin blemishes on fruit. Squish them and leave around the plant as the smell repels other beetles. Some of the fungal diseases that can affect passionfruit such as phytophthora and other root-rots occur where drainage is poor and at times of heavy rainfall and high humidity. This is just a case of preventing fungal diseases happening in the first place, which you can do by keeping your soil full of nutrients, and mounding it up before putting in your plant to assist with drainage. Bees are responsible for most of the pollination and an active bee population is needed throughout the flowering period. As passionfruit are self-fertile good fruit set can be expected from a single cultivar planted in isolation. Fruit is usually picked from the ground as it naturally ripens and drops from the vine. The problem with this is the skin is particularly prone to sunburn at this stage and regular picking throughout the day may be needed to prevent damage to fruit in the hottest months. It pays to give the whole vine a good all-over chop at least once a year towards the end of winter, just when it’s ready to leap into new growth. That reduces the weight significantly and stimulates a lot of new growth on which flowers and fruit will form. Beat the ricotta, milk, sugar, vanilla and egg yolks together in a bowl. Stir in the flour and baking powder with a large metal spoon. Whisk the egg whites till they form firm peaks, then gently fold into the batter with the metal spoon. Heat a saute pan with a little butter and cook large spoonfuls of the mixture for 2-3 minutes on each side or until golden and cooked in the centre. Should make around 8. 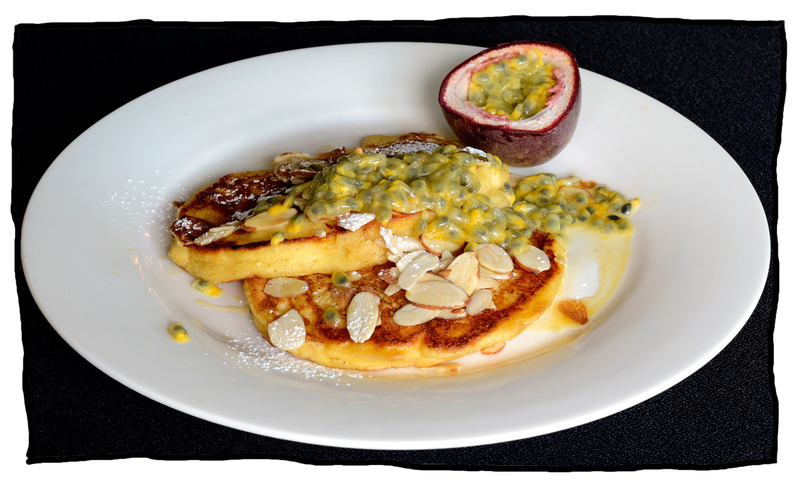 To serve, layer 2 hotcakes on each plate, pour over a small amount of agave or maple syrup, sprinkle over a small amount of sliced almonds, then a little sieved icing sugar, and lastly scoop out the ripe insides of one or two passionfruit over the top. Perfect for a special breakfast! « Passionfruit vines will bear fruit in a relatively short time, around 8-9 months from planting. The fruit ripens from mid-summer onwards.